Learn Market Online > Education > Financial markets > Stocks > What are the differences and similarities between common and preferred stock? What are the differences and similarities between common and preferred stock? 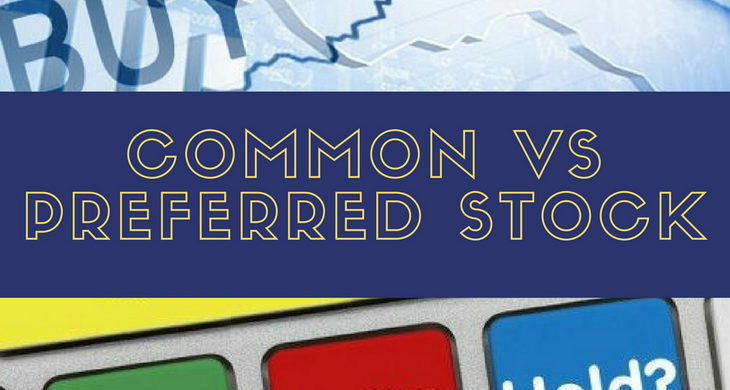 There are countless similarities as well as differences between common and preferred stock. Both of them are representations of ownership of a fraction of a company. They also serve as tools that investors use to make profit from companies. The distinguishing difference between the two is that common shareholders have voting privileges whereas shareholders of preferred stocks may not. The voting privileges for most common stocks is one vote per share. Some preferred stocks permit one or more votes per share whereas others don’t allow voting at all. Regardless, preferred shareholders receive fixed dividend whilst, common shareholders may or may, not receive, depending on the decision made, by the boar,d of directors. Unlike common shareholders, preferred shareholders have a much greater claim to assets of the company. In instances where things are good in the company and they have excess cash and they decide, preferred shareholders will be paid before common shareholders. However, this claim is most useful in times of insolvency when common shareholders are the last in line to get paid. It represents ownership of a fraction of a company and a claim of the net profit made by the company. It is usually accompanied with voting privileges. Common shareholders are the last in line to get paid in the event of bankruptcy. It also represents ownership of a fraction of a company and a claim of the net profit made by the company. Preferred shareholders may or may not have voting privileges depending on the company. There are some differences between the dividends for both common and preferred shares. The dividends of preferred shareholders are generally bigger than that of common shareholders. Dividends for preferred shareholders are paid at a regular interval. This is usually not the case for common shareholders because it’s the board of directors who get to decide whether to pay dividends or not. The divided for preferred stocks don’t fluctuate as that of common shareholders do and as such, if the company misses out on payment even once, it will be required to pay it before any subsequent dividends are paid. Hybrid security is another name for preferred stock because of its bond-like characteristics. Preferred stocks also have a par value just like bonds which also gets affected by interest rate. Value of preferred stock decreases as interest rate increases and vice versa. Unlike preferred shares, the value the value of common shares are regulated by the supply and demand of market participants. In comparison, preferred stocks are less volatile than common stocks. Regardless, there have been moments where preferred have been volatile and lost value. Both common and preferred stocks trade in a similar fashion usually through a brokerage firm and with the same cost of transaction. Due to the fact that the properties associated with these stocks will affect the way investors value them, the prices offered for common and preferred stocks will differ for the same company. Preferred stocks tend to be more stable than common shares because of the regular stream of income. Common shares, on the other hand, will be volatile. It is possible to convert your preferred shares into a fixed number of common shares but unfortunately, common shares don’t have this advantage. Looking up the quote for a preferred stock is as easy as looking up that of common shares.